In addition to weekend holiday parties, it is also the week of work related holiday activities – potluck, lunches, dinner…basically all things food related! At work I actually do work for two different teams so I end up getting double duty on the work holiday festivities. This year, everything fell within a few days of each other. First, I had potluck at work followed by dinner so I wanted a work appropriate outfit that could take me right on to dinner. I had ordered the J.Crew Drapey Silk V-Neck blouse in Belvedere Red to pair with my J.Crew Elsie Plaid D’Orsay Pumps but my blouse did not arrive in time for my dinner so I had to come up with another option. I ended up going with the trusty white and cream combination again, wearing a statement bracelet, simple necklaces and the Tartan Plaid Elsie pumps. While I liked the outfit, I do think these plaid shoes need to be paired with ankle pants to show them off. I also amazed myself getting through a whole day of eating and drinking with these winter white pants on. And holy cow did my feet hurt after a day in these shoes. 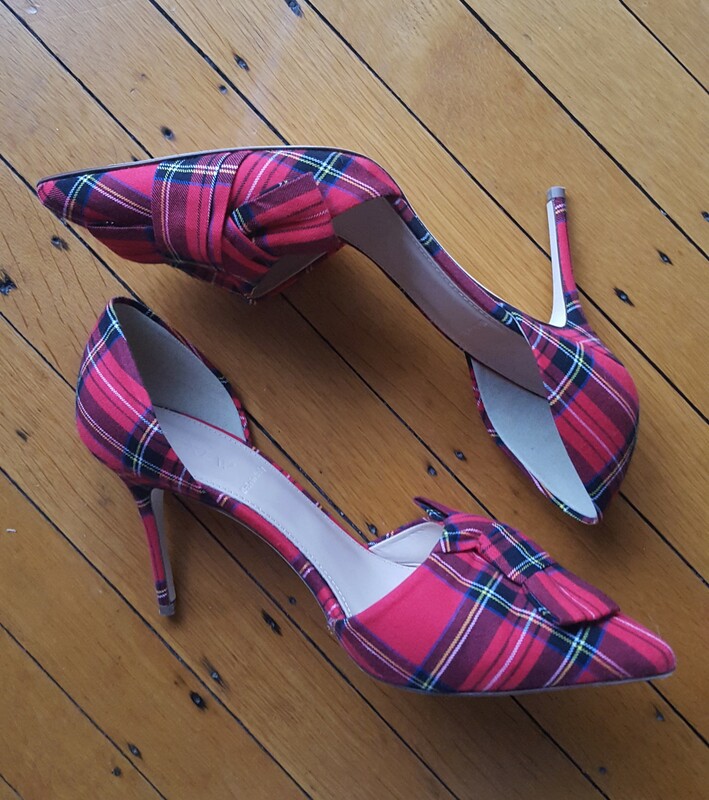 I have the Glossy Elsie D’Orsay Pumps and they are so comfortable – I have comfortably gone all day at work on to evening activities in these shoes and I was disappointed to find the plaid shoes didn’t prove the same. I seem to never be able to get my lipstick and my necklaces in one photo so here’s a photo of my red lipstick. 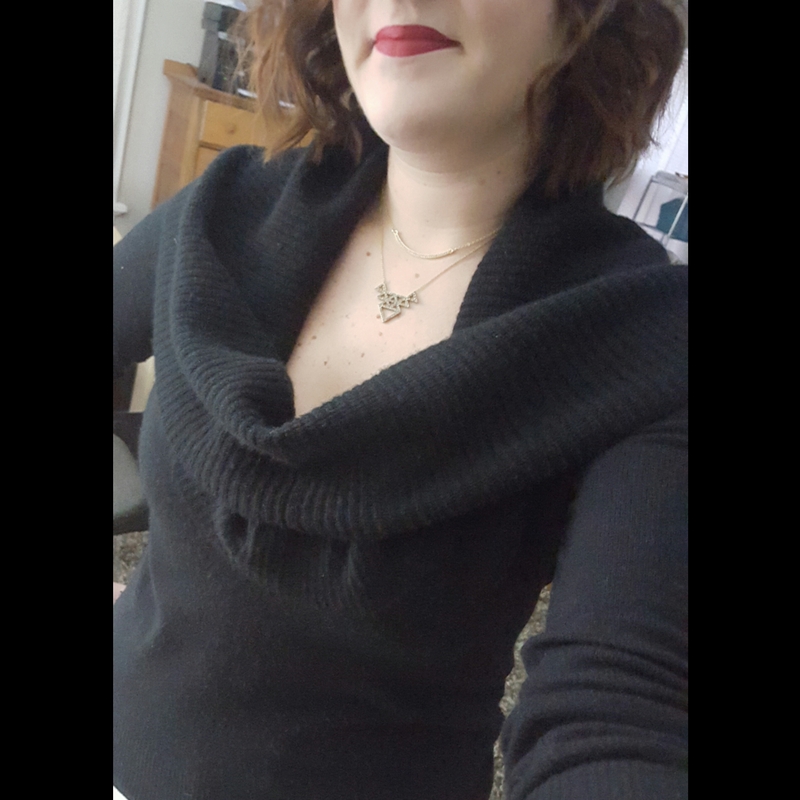 Darker red lipstick is my comfort zone, so doing the bright cherry holiday red is something new for me. I went with the Stila Liquid Lipstick in Fiery and even with a day of eating, only needed minimal touchups. I got home from dinner to find the red silk blouse waiting for me so of course it was time to wear it for the holiday lunch I had the next day! The red was sold out in a lot of sizes in this blouse and I have a size 12 in the blush color but I tried the 10 Tall in the red blouse and it is also a great fit. I have longer arms so the sleeves go right to the end of my wrist but they aren’t too long and I am always ok with a little extra length. I didn’t find it to be smaller through the body than the size 12 so I will have to keep this in mind for future purchases. 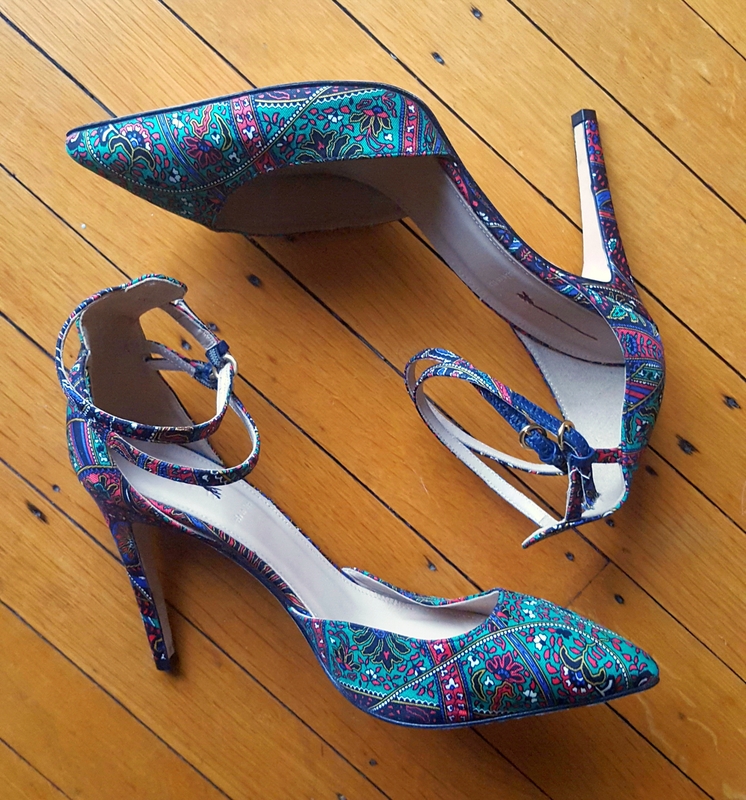 At first I was leaning towards a paisley pair of J.Crew pumps that I found on eBay last fall, the Collection Falsetto Silk Printed Pumps (which are amazingly VERY comfortable. Then I thought, ok, I can do one more day in these uncomfortable plaid shoes. Then I couldn’t decide which to wear. 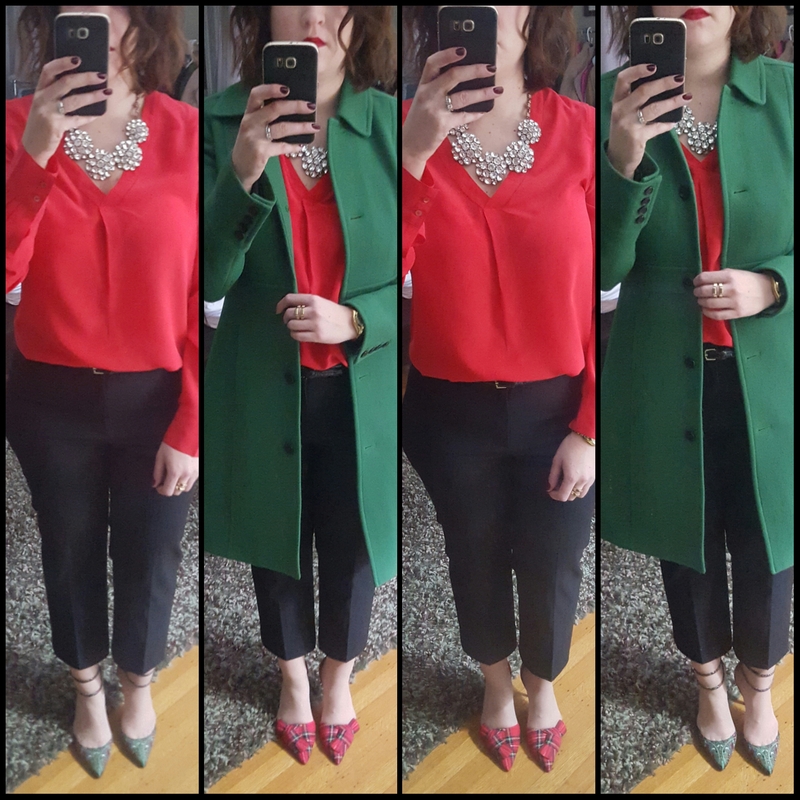 So I put some red lipstick on while I decided, added my J.Crew Lady Day Coat in Oasis Green that I got for a song a few years ago and I think this may be the epitome of a festive holiday outfit for me. A close up because why not?? As I said, I usually tend to go towards the more garnet shade of red so surprisingly when the holidays roll around I don’t have a lot of cherry red in my closet. This blouse is a great addition to my closet and I think it may make another appearance on Christmas Eve. And update – I gave the plaid shoes another spin with stockings on and they were much more comfortable which is a big relief! I think wearing them barefoot made them rub more on my feet which is no good! So, how are you dressing for holiday work events? Which of the shoes do you like best with the red blouse? Would love to hear what you think and thanks for visiting! You’re working your holiday looks. Love them, Anne! I love that blouse. I wore mine the other day and decided I will wear mine for Christmas, too! Thanks Susan!! With our mild temperatures I’ll definitely be wearing this top again soon! !